It has been a few months since I played in Deborah's Card Chain Challenge. Each participant makes a card, sends it and gets one. I love that she published all the options for sketches, colors and theme's for the entire year in January, it is posted here. 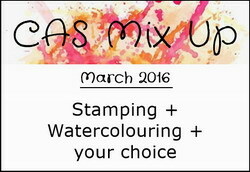 For March, I chose to use watercolors for my card. I am definitely in flower mode now that we are getting a bit more light each day and the temps are not so cold. This card is going to Stacy in NV. You can still sign up for April, here. Thanks so much for stopping by! I chose to use copic markers on this project. My stamp is an old but much loved stamp from Hero Arts called Delicate Blossom. I tried some no line coloring by stamping the image in a very light gray ink and then coloring it with copic markers. My card base also has a very light tone on tone stamping with Hero Arts Envelope background. The oval frame die cut is from MFT. Muse # 159 is provided by Jenni Murray, a beautiful poppy card. I love the bit of dark border around her image, and I have an old poppy stamp that I haven't used in quite a while. This time I tried something completely different for me with the stamp. First the stamp is Delicate Blossom by Hero Arts. It has two poppy bunches, and their petals are lined. I wanted to try this as a no line coloring experiment. I learned two things for my style. 1) Each section or petal had to be colored separately, or I would lose the line shape of the petal. 2. It wasn't a fluke the first time I colored it, the second one turned out just as nice. YEA! A blogging friend has purchased a new home, and I wanted to send her a little card to commemorate the occasion. 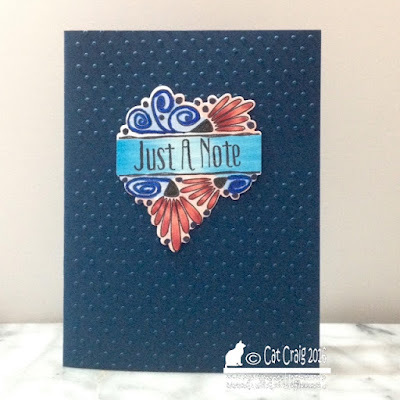 Tracey McNeely posted a beauty for us over at Muse Card Club Challenge #158. I have been thinking a lot about what to do. In the end I chose the same Mondo Hydrangea stamp from Ellen's Essentials and did a similar coloring profile with copic markers and a touch of Spectrum Noir Sparkle maker in pink. My sentiment came from Winnie and Walter...I have 8 April birthday's to stock up for. 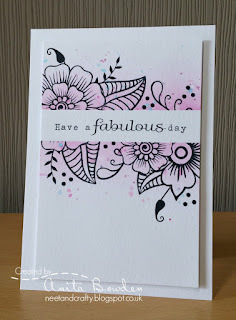 I wanted almost a no line look as Tracey achieved with her white embossing on the white card front, so I stamped my image in memento angel pink. I think if I did it over my sentiment would be stamped in smokey grey instead, but all that coloring...not starting that over. I added a few doodle bug sprinkles just to add a little texture to the card. Here are the last of the very few Easter cards I made this year. Thanks so much for stopping by. Have a most joyous Easter. for the crafty gals I meet with most weeks. I am so blessed to have found these lovely ladies to share this crafting passion we all have. They are all fabulous paper crafters, so I try to do something different. These are crochet baskets with a flower on the side. They have been filled with some miniature chocolates--Crafting and Chocolate...right? The pattern is very quick, these were made over the course of a few evening's television watching. I modified the original pattern shown here You Tube. After each round close with slip stitch. 5 petals, each petal is a chain of 2 single crochets, 2 double crochets and a slip stitch into the middle of the ring. Start the petal with the chain of two single crochets. Close with slip stitch to join. Either fill center with a button or contrasting yarn stitching. I recently picked up this crocus stamp from Technique Tuesday. I took it with me for crafty Tuesday with the ladies. I didn't get much done, but had a good time. I am still on my colored pencil coloring kick, and I love how this turned out. While there is no caterpillar or butterfly here...the crocus always reminds me of Easter and Springtime. And just like many of the spring bulb flowers that die and go to ground in the fall, they rise up each spring to bloom anew. At Addicted to Stamps and More it is a photo inspiration this week. I was inspired by the large sentiment on the right side. I decided to go with bold flowers and a longer sentiment for my card. Making cards with flowers on it makes me Happy! I used Penny Black's Divine and a sentiment from Stampendous. A bit of blue inking around where I estimated my flower stamp would land. Then the flower was stamped, the sentiment next, and then the coloring work began. I am still playing with colored pencils (Artist's Loft) and gamsol. I love the blend that achieves. I finished the whole thing off with some sequins and itty bitty bling. I mounted the card front on to a similarly colored card base. Of course I have had a whole week to work on it, but somehow I never got to it. Here is the sketch for Freshly Made Sketches # 228. I pulled out an un-inked stamp set from Stampin Up - Best Thoughts. I love hydrangeas. I must have 5 different stamps. This mophead is fabulously drawn. For the card base I added a bit of tone on tone with the Stamping Up Hardwood stamp for some texture. I took out my colored pencils (Artist's loft 48 pk) and went to work with 3 pinks and 3 greens. A bit of gamsol to blend it at the end and it was time to fuss with the sentiment. For the second time in a row, I had to cover a boo boo...but again it looks better with the bit of white on black for additional contrast. There is a long list of techniques for the your choice portion of the challenge. I am choosing gold splatters (spattering) for my choice. I used Gansi Tambi watercolors in a wet on dry technique. I wanted the flowers to be very boldly colored, and the dry base keeps the colors from fading. I added some gold spatters with Heidi Swapp's gold color shine spray. The hardest part of this is waiting for it to dry. My laptop rests on a cooling fan pad. I often will raise up the front of it and slide my project under it. Faster than air drying, no warping like heat tool drying. The sentiment was added last. 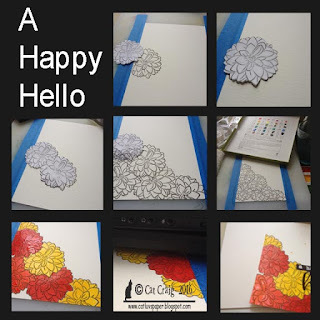 I made a bit of a mistake with the a happy, it was originally stamped in black, but it got lost in the flower and I didn't know if I could outline in white (a la Kelly Latevola) would work on top of watercolors. So I white embossed it on black and glued it over my mistake. I like it better with the black strip! Win Win. Since I have the spatters, I felt no need for sequins or bling. The watercolor panel was trimmed to fit inside an A2 card base. I decided to make a little collage of the process while I waited for it to dry. When I used watercolor paper, my most favorite card stock for the card base is Oatmeal by WPlus9. It has soft flecks on it and goes well with the color and texture of the watercolor paper(canson xl). Stamps were all by Winnie and Walter. I cut two masks from printer paper. No adhesive was to the back since no blending was done over the top of the masks. They sat flat very well. This considerably shortens the time to create the card front. Oh those dreaded man cards. I could sometimes just pull my hair out thinking about what to make. A friend of mine has a birthday coming up. I have known him for 30+ years, he is an outdoors kinda guy so I am hoping he likes this card. I know the swing is a bit young...but maybe it will remind him of more carefree days! 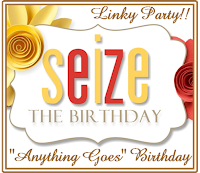 I am playing along at Seize the Birthday, where the challenge is anything goes with a birthday theme and the optional topping is "the great divide". The image is from Stampendous, the sentiment is a sticker (I needed something small). The back drops are sponged inks from Simon Says Stamp, and the tree and grassy area are colored with copics. Thanks so much for stopping by. Today Cindy hosed a scramble over at Hero Arts; it is actually a 24 hour scramble in which the participants can choose their own 90 minute creation time as long as the final card/project is posted by 3 PM EDT March 20, 2016. I masked and stamped the blossoms several times along the side and bottom. They were colored with copics, the sentiment is also from Hero Arts and the butterflies come in the dogwood blossoms set as well. Two of the butterflies are stamped on the card's interior panel and show through die cuts on the front card panel. If you are inclined to play, here is the Scramble Link.. This week's Muse, Anita Bowden has provided a split image with a centered sentiment for our inspiration. I love that split image with the sentiment in the center. The light color wash really highlights her image. I recently purchase a split image with sentiment from PTI, its is called Splits - Just a Note. I love that it is all sized to go together. I also got the die. I really like the art deco feel of the design, and I think using reds and blues makes this a perfect card for my Dad. The card base was embossed with a Cuttlebug Swiss Dot folder on the top and bottom, leaving a portion unembossed. I love Tuesday Crafty days. We have a group of about 8-10 women, and at anyone time at least 5 get together for crafting and chatting. 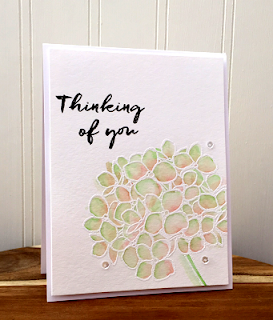 Today, I played with Simon Says Stamp's Spring Flowers, and PTI's Keep it Simple: Just Because sentiments. I stamped the stamp set many many times and clear embossed it. Then I inked it up with distress inks, fussy cut the images and built bouquets. I was inspired by Laura Bassen's technique for coloring the blooms, her post is here. I have 5 cards, and like bouquets they each have their differences. I loved the gold embossing and the holly across the bottom edge. I used her design and went with all gold embossing and mounted my panel on a green card base with just a bit peeking over the top and bottom edges for a touch of color. Stamps were all from Simon Says Stamp. I have been getting bogged down in making too many cards for my self imposed requirements. I make about 130 Christmas cards, and between 20-45 cards each for Halloween, Thanksgiving, Valentines, St. Patricks, and Easter. I rotate so my friends got at least one holiday card other than Christmas along with birthday cards. It is beginning to affect my mojo and my joy in making cards. I am going days without making a single card. That is something I used to enjoy almost every day; and I miss getting lost in the creative process. Last month, I decided to skip St. Patrick's day cards since St. Patrick's Day and Easter fall so closely together this year. That helped just a bit, but I still felt overwhelmed. Now, after much thought I have decided to also do away with making so many cards for the non-Christmas holidays. I am going to do my best to remember birthdays, they are important. And I am going to make the majority of my cards "just because". I think an unexpected card brings more joy to the recipient than a possibly anticipated one due to a holiday. Now that I have decided and am at peace with the decision I am letting friends know. Last night I felt an immediate relief, and a desire to get back to my cards. I sat down and made several. Today's card I made based on a photo a friend posted on facebook of some "just because" pink tulips her hubby brought home to her. She was thrilled with them. Just because = Joy. The image stamp set is Addies Garden from Winne and Walter, the sentiment is from PTI's Keep it Simple- Just Because (it has 6 versions of the sentiment). Thanks so very much for taking the time I appreciate your visit. I like the angle and the raised die cut. They both really stand out. It also give me a chance to combine challenges and include this in Darnell's NBUS#6 Challenge since I'll be using my new Mondo Hydrangea stamp set from Essentials by Ellen. I have a slight angle in my version. I had hoped to make the die cut stand out a bit by using the colored fun foam, as well as some WOS and Glossy Accents. In additon to muse, this also is going to Darnell's last day of her NBUS Challenge since my stamp was new. I played some with the March Card Kit from Simon Says Stamp. I tried for 8 cards, but ran out of ideas and seriously trashed one card base. I don't want to copy the examples they send, so sometimes this is such a difficult thing to accomplish. 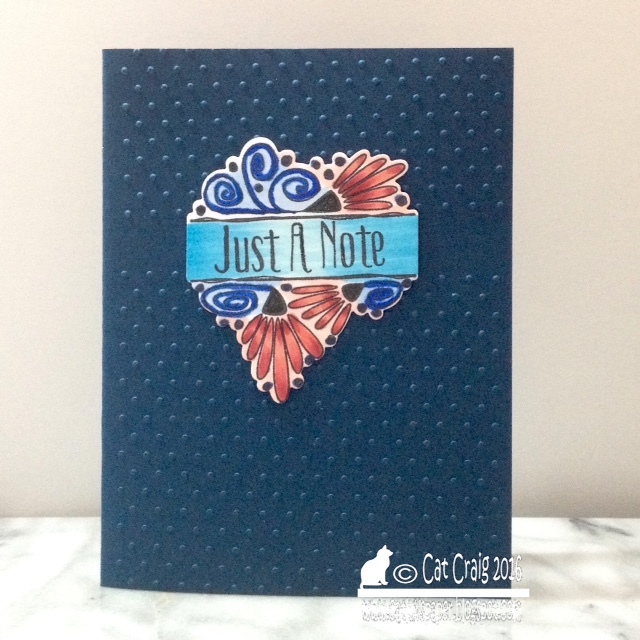 In addition to the kit contents, I also used a tag die and stamps from PTI, Lawn Fawn's grassy border die and Pretty Pink Posh's Storybook 1 die and a Simons Scalloped Border die. I have to admit to majorly crushing on that pastel plaid! I actually cut it to use the other side, and when I turned it over...well plans do change. I stumbled on this Paper Smooches stamp set and I have to say I love these chubby lil guys. I love the punny sentiments, and I think they are great for a quick Hi-Hello-Been-Thinking-About-You kinda note. I put them on a 3.5 by 5 card and sent them off just because. There is also a cow, which I already blogged here, and there is a puppy image which I haven't made into a card yet. I had a cute one colored, then I started with the card and added something that just ruined the front of the pup. So that one I will have to get back to. The set is called Chubby Chums and comes with 5 animals and 5 punny sentiments. They are all copic colored and fussy cut (ick--I thought about investing in the dies, but the shapes are not really all that difficult) then mounted with foam tape to smaller card fronts. I was playing with a new-to-me stamp set with a coffee cup image. I used to my computer to type up some sentiments so I could send a few note cards out. The two smaller cards are each 1/2 of a regular A2 sized card. I think they are great for the small cup image. The flat card is A2 sized. I am so happy not to be traveling during Darnell's NBUS Challenge. I have a bin of new stuff that needs to be inked, cut and put on a card front. First up, for my Dad. I was not enamored of those crazy birds when they first came out...but the silly little creatures have grown on me. I think they are great for man cards. Since I send my Dad a lot of cards, they will see ink. My NBUS items are the Bird from the Crazy Birds stamp set by Stampers Anonymous, the Gingham by Impression Obsession, and the sentiment from That is all by WPlus9. With that yellow bird, I though the blue violet ink and cardstock from Simon Says Stamp would be a great contrast and take this card straight to man-land! Thanks so much for stopping by, and if you have never-before-used-schtuff make a card and post it over at Darnell's blog!